[S74] S.V. Talcott, Genealogical notes, p. 329. Philip Jeremiah Schuyler was born on 20 January 1768 in Albany, New York. He was the son of General Philip John Schuyler and Catherine Van Rensselaer.1 Philip Jeremiah Schuyler married Mary Ann Sawyer.1 Philip Jeremiah Schuyler died on 21 February 1835 in New York City at the age of 67. [S21] Various editors, Dictionary of National Biography, Schuyler, Philip John. [S250] Saint Nicholas Society, Vol. 2. p 45. 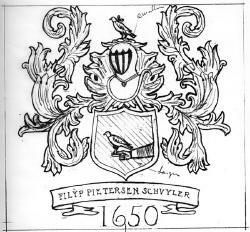 Philipse Pieterse Schuyler was the first outstanding member of early Albany's most important New Netherland family. By 1650, he had emigrated to New Netherland with his younger brother, David Pieterse. In December 1650, twenty-two-year-old Philip Pieterse was in Rensselaerswyck where he married Margarita Van Slichenhorst - daughter of the director of the colony. That union admitted a newly arrived carpenter to the upper echelon of New Netherland society. It also produced a large family of twelve American-born children between 1652 and 1672. Eight of those offspring went on to establish the Schuyler family in Albany and beyond. Taking the surname of their mother's family, the Schuylers' success followed the meteoric rise of its founder. Settling in Beverwyck, Philip Pieterse was among its earliest householders when lots were first apportioned during the 1650s. Although nominally a carpenter or gunstockmaker, like many of his neighbors he entered the fur trade. By 1660, he stood with the principal traders of the community. He used those profits to begin a favored family practice of acquiring additional real estate. Those holdings began with the house he built on the corner of today's State and Pearl Streets. It remained a family fixture for most of the next hundred years. By 1672, he also had acquired land along the Hudson beyond the Van Rensselaer manor house. That farm became a family summer home known as "the Flats". In addition, Philip Pieterse owned houses and lots in New Amsterdam/New York, several hundred acres east of the Hudson and below Rensselaerswyck, and lots in Wiltwyck and at Halfmoon as well. His marital connection to the New Netherland power structure set the stage for his appointment to the Beverwyck court. After the English take-over, he was appointed a magistrate of the Albany court - predecessor of the Albany Corporation. 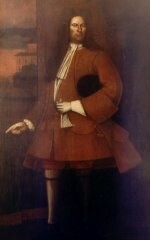 Although he retired from the court in 1671, he was considered one of Albany's leaders for the rest of his life. Sometimes referred to as "Captain Schuyler," he held military commissions under the Duke of York and also was appointed "commissary" at Albany in 1666. He was the first of many Schuylers to represent Albany in meetings with the Iroquois. Born in Holland, Dutch-speaking Philip Pieterse was the first of several generations of independent but reasonable Albany leaders to be favored by the English and British with official appointments, access to land, and contracts. Albany was the northernmost settlement of any size in New York province. Two hundred miles almost due north lay Montreal. Though separated by impenetrable wilderness, the two settlements were joined by an almost continuous waterway consisting of the Richelieu River, Lake Champlain, Lac Saint-Sacrement (Lake George), and the Hudson River. The French claimed all the territory whose waters found an outlet in the northern lakes and the St. Lawrence, by right of discovery and occupancy. It included Lake Champlain. The English resisted the claim and asserted their right to the country as far north as the St. Lawrence, through a title derived from the Five Nations. During a long period of almost continuous warfare, the Iroquois sided mostly with the English, partly because Albany was nearer their homeland and easier to trade with, and partly because of the great skill of Peter Schuyler in dealing with them. Schuyler had important family connections at Albany. Both his mother and his second wife were daughters of directors of Rensselaerwyck, one of the founding Dutch settlements in the Albany area. When Albany was incorporated as a city in 1686, Peter Schuyler became its first mayor and ex officio chairman of the board of commissioners for Indian affairs. During the next several years there were raids and massacres at Lachine near Montreal, at Schenectady near Albany, and elsewhere within the disputed borderlands. In 1690 Peter Schuyler, hearing that a French delegation was treating with the Iroquois, led an English delegation to Onondaga (Syracuse, N.Y.), the Iroquois capital. The French were captured and some were killed, but at least one, the Chevalier d'Aux (Eau)—a half-pay captain who had been sent as an emissary to the Iroquois by Buade de Frontenac, governor of Canada—was taken back to Albany by Schuyler. The Iroquois called Schuyler "Quider" (their pronunciation of Peter), and according to Parkman an Onondaga sachem declaimed: "Brethren. . . we must hold fast to our brother Quider, and look on Onontio (Frontenac) as our enemy. That same year an English expedition against Canada was assembled at Albany and placed under the command of Major-General Fitz-John Winthrop. Peter Schuyler collected a few Mohawk warriors and proceeded to Wood Creek, at the southern end of Lake Champlain, where he engaged in making bark canoes for the use of the army. Since there were not enough canoes or supplies, General Winthrop abandoned the expedition. The following year (1691), a rumour reached the English that Frontenac had received reinforcements and supplies from France and was concentrating troops at Montreal, preparatory to a descent on Albany. In order to gain intelligence, Major Peter Schuyler led northward, in July, a party consisting of 120 white men, 80 Mohawks, and 66 River Indians (Schaghticokes). At the confluence of Lac Saint-Sacrement and Lake Champlain, called Ticonderoga, Schuyler was joined by an additional contingent of Mohawks, and the expedition proceeded down Lake Champlain and the Richelieu River until it was within ten miles of Fort Chambly, which was commanded by Jean-Vincent Le Ber Du Chesne. Scouts from the fort notified the Chevalier de Callière the governor of Montreal, who collected from 700 to 800 men and encamped at La Prairie de la Magdeleine on the south shore of the St. Lawrence, opposite Montreal. He then sent out several scouting parties, and a few days later one of the sons of Joseph François Hertel de La Fresnière brought in word that he had seen a canoe containing Mohawks in the Richelieu River. Thinking that Chambly was in danger, the governor of Montreal sent Philippe Clement Du Vuault de Valrennes to the spot with about 200 men. Nicolas Daneau de Muy and Claude Guillouet d'Orvilhers were in the company. Meanwhile, Schuyler, leaving his canoes on the riverbank, had made his way overland to La Prairie de Ia Magdeleine, reaching that fort on the rainy night of 31 July (10 August, N.S.) An hour before daybreak on 1 August (11 August) the sentinel at the fort fired his piece and M. de SaintCyrque (Sircq), an old captain commanding in the absence of Callière who was ill and confined to his bed in the fort, led an advance. A musket volley mortally wounded him and the Sieur d'Escairac (Desquerac), and killed M. d'Hosta (Dosta) on the spot. The second wave of troops led by Jean Bouillet de La Chassaigne came up at that moment and rushed headlong on the enemy who, after a vigorous resistance, retreated in good order. Another small French detachment, led by the Sieur Domerque, attacked Schuyler's retreating forces and was wiped out. Schuyler now headed for his canoes on the Richelieu River but was intercepted by the party sent out to protect Fort Chambly. Valrennes and Le Ber deployed their men behind trees and fought the English for an hour and a half. Schuyler finally succeeded in cutting his way through the enemy and reached his canoes. As he reported to the provincial council in New York a few weeks later, "We took our march homewards and found 5 Elks in the way which refreshed our whole company.. . . We lost in the expedition 21 Christians 16 Mohaques 6 River Indians & the wounded in all 25.... Thought to have killed about 200 French and Indians." The bravery and competence shown by Schuyler's expedition made a favourable impression on the Indians of the Five Nations, who were now convinced that the English could fight and were willing to risk their lives in the war. During the winter of 1692—93 Frontenac sent southward an expedition, commanded by Lieutenants Nicolas D'Ailleboust de Manthet, Augustin Le Gardeur de Courtemanche and Robutel de La Noue, which destroyed three Mohawk villages and captured many women and children. Schuyler led a party which pursued the retreating French and forced them to relinquish most of their prisoners. When peace was concluded between England and France, the Earl of Bellomont, governor of New York, sent Schuyler and the Reverend Godfrey Dellius to Quebec in May 1698 to deliver news of the peace to Count Frontenac, and also to return all French prisoners held in New York. This was Schuyler's last expedition to Canada. Schuyler was made a lieutenant of Francis Nicholson for the proposed expeditions against Canada in 1709 and 1711. Their forces were to attack by way of Lake Champlain. In both cases, however, the forces never got beyond the Lake Champlain camping grounds. Early in 1710, Schuyler took four Mohawk sachems to London where they were received by Queen Anne. His aim was to emphasize the importance of retaining the friendship of the Five Nations. [S58] Various Editors, Dictionary of Canadian Biography, vol. II p. 602.